It’s always interesting to read about the concept of flattened or “matrix” organizational structures for companies, and how they offer a much more creative and fulfilling environment for employees when compared to working within a more traditional hierarchical organizational structure. … And then you read about a company that actually tries to implement such an organizational model — and gets thrown against the rocks in the process. The latest example is Zappos, the online shoe and clothing retailer which has built its business and reputation on exquisite customer service. For years it’s also been known as a company willing to experiment with nontraditional human resources models. The most famous of these is known as “the offer,” where new hires are given the opportunity to take a $2,000 stipend in lieu of remaining on the job – the idea being that it’s a practical as well as humane way to ensure that Zappos employees are the best “fit” for the company. 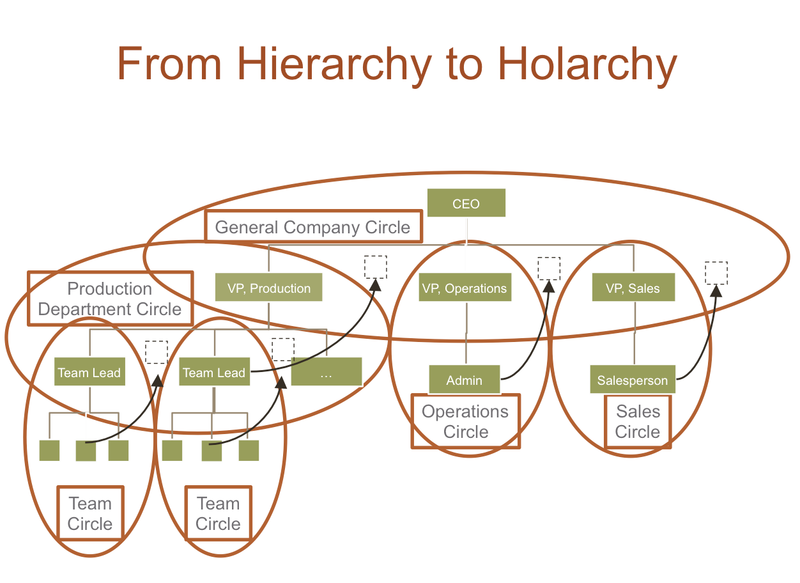 The company’s latest endeavor has been to introduce a new management structure known as a “holocracy.” This structure, adopted by Zappos in 2014, aims to facilitate (or codify, actually) collaboration among workers by essentially eliminating workplace hierarchies – as in no titles and no direct-report bosses. I think you might know where this is headed: Self-governance isn’t a tidy business, and there’s a good dose of mixed signals and even confusion that comes along with it. How do strategic initiatives and tactical tasks get done efficiently? How do co-workers (as well as outsiders) know what each employee “does”? How are employees monitored and evaluated on their work performance and contribution to the success of the enterprise? And how about this: Try determining salaries for existing and prospective new employees after titles have been eliminated. Guess what happens when confusion reigns in any organization? Attrition rates rise. As reported this month by Bourree Lam in The Atlantic, in the case of Zapppos, nearly one in five employees have taken buyouts since last spring, resulting in an annual turnover rate of ~30%. That’s dramatically higher than the typical attrition rate at companies. Weeding out less productive workers is a staple in managing for business efficiencies, productivity and profits. But when nearly one-third of your entire staff is leaving the company within a 12-month period, you’re getting into territory where “institutional knowledge” is in serious danger of being lost. Research by Stanford University’s Graduate School of Business and other institutions shows that the more “egalitarian” an organizational structure is, the more unpredictable and potentially disorienting it is to workers. Simply put, most people prefer a defined “pecking order.” They might grumble about corporate hierarchies, but those structures are more “predictable” and many workers find them to be more psychologically comfortable. The reality is that holocracries, flattened and matrix organizational structures are often less efficient than hierarchical ones. They may well spur more innovation and creative thinking, but the price paid in lost efficiency may be too high for many companies. In my personal experience working with a matrix organization (not as an employee but as a person providing business support services to the company), I’ve seen where a matrix structure can actually work. It certainly helps if the business has strong, industry-leading products that are protected by patents and that benefit from being able to command high prices and correspondingly high product margins. Zappos isn’t operating in any such marketplace. It has little or no protection against aggressive market competitors entering its space. Profit margins in retail are famously tight. It’s just not clear that any company can operate successfully in that space for any length of time without keeping very tight controls over operating expenses and also squeezing as much productivity out of each employee as possible. With a pronouncement like that coupled with a big financial carrot, it’s understandable why so many employees have taken up Zappos’ severance package offer. The next question is this: Will Zappos emerge as a stronger, more creative and more nimble company as a result of its transition to a holocracy structure? Or will the initiative turn out to have been a massive miscalculation? If you work in a flattened or matrix organization structure and have observations to share about its positive and negative aspects, please leave comments. I’m sure other readers would be quite interested to read them.